apples of your choice and a 14oz. tub of Old Fashion Creamy Caramel Dip. A perfect treat for the apple lover with a Sweet Tooth. Packaging to arrive at the destination of your choice in perfect condition. Choose a variety for each layer from the dropdown menu's. 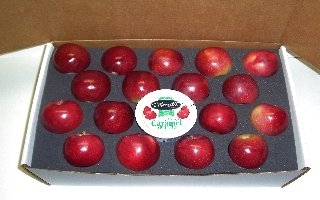 This bundle removes one apple from our standard 36 count box to make room for a 14oz. tub of Old Fashioned Creamy Caramel Dip. to them. Hand selected and packed for you just the way nature grew them.